Before Koi… Mil Gaya (2003) revolutionized the way films were made in Bollywood, there was the box office smash Kaho Naa… Pyaar Hai (or Say That You Love Me). Kaho Naa… Pyaar Hai was the big screen debut of Hritik Roshan, the Hindi superstar-in-waiting whose dashing good looks, sculptured physique and mad dancing skills would shoot him into the hearts and loins of women of all ages. 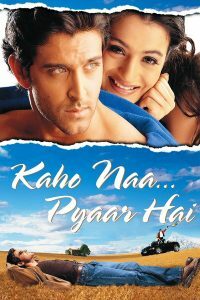 Kaho Naa…Pyaar Hai amassed a record 102 awards at every award ceremony in the country, grossed 3.6 billion worldwide and made stars out of Hritik Roshan and Ameesha Patel. Not bad for a rom-com with a rather perfunctory plot and a selection of decidedly average songs that were catchy but had not much in the way of hooks. More importantly though is that Kaho Naa… Pyaar Hai set the stage for the sweet family masala Koi… Mil Gaya (2003) and the future Krrish franchise. Kaho Naa… Pyaar Hai was so lucrative that an attempt on the life of director Rakesh Roshan was made just a week after the movie’s release. He was shot several times just outside his office on Tilak Road, Santacruz in Mumbai by two hitmen from extortionist and Indian Mafia don Ali Budesh before whom he refused to bow. By the time actor, producer and writer Rakesh Roshan came to direct Kaho Naa… Pyaar Hai he had plenty of experience as an actor and had helmed a whopping 8 features (going as far back as 1987) all starting with the letter K. Roshan is often (and not without reason) accused of pilfering western properties for storylines and characters from Koi… Mil Gaya (2003) onwards, Kaho Naa… Pyaar Hai on the other hand does the exact opposite. The plot recombines plotpoints from Khudgarz (1987), Khoon Bhari Maang (1988) and Koyla (1997) into a fun, if not exactly riveting, little romp that gets by more on its inherent sweetness than its actualy storytelling. Roshan originally envisioned to helm the production on the Fiji Islands but when the necessary permits couldn’t be secured New Zealand was chosen instead. Aishwarya Rai Bachchan and Kareena Kapoor were initially offered the role of Sonia. Aishwarya Rai Bachchan politely declined the part for reasons unknown. Kareena - the granddaughter of Raj Kapoor, daughter of Randhir Kapoor & Babita and sister of Bollywood superstar Karisma Kapoor – was forced to pull out just days into shooting after her mother got into a heated argument with director Roshan. Eventually Roshan decided on Ameesha Patel. For western audiences Kaho Naa… Pyaar Hai will probably look like an Elvis Presley musical comedy and a Frankie Avalon-John Ashley beach party movie from the sixties combined with a truncated The Blue Lagoon (1980) vignette for good measure. Hritik Roshan and Ameesha Patel are a joy to behold, but there is nary any chemistry to speak of between the two. Kaho Naa… Pyaar Hai is a romantic desi masala for the entire family that even western audiences might find appealing. It’s not quite on the level of Roshan’s later productions, but it works well enough for what it is. That Hritik Roshan was destined for superstardom was clear from his debut performance (in a double role, no less) here. Kaho Naa… Pyaar Hai is a valentine to his every move, his every glance and an extended preamble to showcase his dancing skills. In quite a few ways Roshan (the elder as much as the younger) lays the groundwork for the 2003 box office smash that would establish them both. In Kaho Naa… Pyaar Hai Roshan the younger for the first time portrayed a sculptured, good-natured working class guy as well as his bespectacled, more reserved and introverted counterpart. Ameesha Patel combines the regal posture of Mia Sara in her prime with the doe-eyed innocence of a young Shiri Appleby but is in the habit of hamming it up every once in a while. Granted, her grand declaration of love ‘Janeman Janeman’ (‘Sweetheart’) is adorable in every way even though her dancing tends to be a bit stiff. Patel does look quite fetching in her blue veils in the love song ‘Na Tum Jano Na Hum’ (‘No, You Know, Us’) and ‘Pyar Ki Kashti Mein’ (‘On the Ship of Love’) introduces the well-known melody that Koi… Mil Gaya (2003) would use for Jadoo and that Krrish would later inherit. The soulful Lucky Ali r&b club banger ‘Ek Pal Ka Jeena’ (‘There’s Only A Moment To Life’) could have easily charted in the US and Europe had it been given an English make-over. In retrospect most of it, the romantic entanglements especially so, feel like a dress rehearsal for the later and overall superior feel-good masala Koi… Mil Gaya (2003). Hritik Roshan playing a double role and characters named Rohit, Raj, Sonia, and Saxena all would make their return in future Rakesh Rohan productions. A lot of it feels like a test-run for something more ambitious and grander in scope. At the heart of most Bollywood productions is a romance and in case of Kaho Naa… Pyaar Hai that was its entire raison d'être. Compared to the on-screen romance between Hritik Roshan and Preity Zinta in Koi… Mil Gaya (2003) and Priyanka Chopra in Krrish (2006) the courtship and eventual union with Ameesha Patel is fairly uneventful outside of the uncharted island segment. Ameesha Patel is adorable as many Hindi women in these productions tend to be but she isn’t a great actress by any metric of choice. Her presence is illuminating certainly, but it’s not as if she’s setting the screen alight quite in the same way Preity Zinta and Priyanka Chopra would years later. It’s not even for a lack of trying on Patel’s part either. The love scenes are good for what they are but there’s never quite any sparks or electricity between both leads. The action sequences are serviceable enough but tend to stick out for all the wrong reasons. Sonia’s friend Neeta (played by Tanaaz Currim Irani) obviously was the basis for Honey (played by Manini M. Mishra) in Krrish (2006). In fact most of everything retroactively served as a model for things that turned up later in Koi… Mil Gaya (2003) and the ongoing Krrish franchise. It’s hardly the worst complaint to level against the movie. Kaho Naa… Pyaar Hai was in the unfortunate position of being retroactively eclipsed by the two box office smash hits that followed it. Not that that in any way diminishes the overall effectiveness of this little rom-com. This is the sort of injection that many Western rom-coms would benefit tremendously from. Ameesha Patel is cute as a dish and Hritik Roshan is a lead man with talent to spare. Kaho Naa… Pyaar Hai is a standard romantic comedy enlivened by its selection of some halfway decent (and a few surprisingly really good) songs. Compared to later Roshan productions Kaho Naa… Pyaar Hai is much smaller in scale and scope. It is a fun little movie sure to elate the spirit with its kind-hearted nature and stubborn belief that love indeed does conquer all. In Kaho Naa… Pyaar Hai Roshan the elder’s quirkier tendencies are reined in and it's fairly conventional as such. Talks of a sequel have been making the rounds for years, but nothing substantial has come from it thus far. Anybody interested to see where one of India’s best-paid actors was launched needs to look no further.